On the afternoon of Monday, May 20, 2013, a large and extremely powerful EF5 tornado ravaged Moore, Oklahoma, and adjacent areas, with peak winds estimated at 210 mph (340 km/h), killing 24 people (plus two indirect fatalities) and injuring 212 others. The tornado was part of a larger weather system that had produced several other tornadoes across the Great Plains over the previous two days, including five that struck portions of Central Oklahoma the day prior on May 19. The tornado touched down just northwest of Newcastle at 2:56 p.m. CDT (19:46 UTC), and stayed on the ground for 37 minutes over a 17-mile (27 km) path, crossing through a heavily populated section of Moore. The tornado was 1.08 miles (1.74 km) wide at its peak. It followed a roughly similar track to the deadlier 1999 Bridge Creek–Moore tornado, which was smaller in size but just as severe; however, very few homes and neither of the stricken schools in the area had purpose-built storm shelters in the intervening years since the earlier tornado struck Moore. Comparison between the preliminary tornado track (red), the 1999 Bridge Creek–Moore tornado (green), and the 2003 Moore–Choctaw tornado (blue); graphic produced by the National Weather Service Norman, Oklahoma. On May 20, 2013, a prominent central upper trough moved eastward toward the Central United States, with a lead upper low pivoting over the Dakotas and Upper Midwest region. A Southern stream shortwave trough and a moderately strong polar jet moved east-northeastward over the southern Rockies to the southern Great Plains and Ozarks area, with severe thunderstorms forming during the peak hours of heating. With the influence of moderately strong cyclonic flow aloft, the air mass was expected to become unstable across much of the southern Great Plains, Ozarks, and middle Mississippi Valley by the afternoon hours. Evidence of an unstable air mass included temperatures in the low to mid 80s °F (27–30 °C), dewpoints that ranged in the upper 60s °F (20 °C) to the lower 70s °F (20–22 °C), and CAPE values ranging from 3500–5000 J/kg. Deep-layer wind shear speeds of 40 to 50 knots (46 to 58 mph) enhanced storm structure and intensity. These were present ahead of a cold front extending from a surface low in the eastern Dakotas, southwestward to near the Kansas City area and western Oklahoma, and ahead of a dry line extending from southwest Oklahoma southward into northwestern and west-central Texas. Outflow remnants from the previous night and the early day convection across the Ozarks and the middle Mississippi Valley were a factor in severe weather development with the most aggressive heating and destabilization on the western edge of this activity across the southern Great Plains and just ahead of a cold front. The National Weather Service office in Norman, Oklahoma had warned as early as May 15 that there would be a possibility of severe weather on May 20. The most intense severe weather activity was expected to come across the southern Great Plains, specifically Central Oklahoma, during the afternoon hours on that Monday. As such, the Storm Prediction Center issued a moderate risk of severe thunderstorms during the early morning hours of May 20 from southeastern Missouri to north-central Texas. The degree of wind shear, moisture, and instability within the warm sector favored the development of supercells. Very large hail and tornadoes were both expected with these supercells, with the possibility of a few strong tornadoes. The Storm Prediction Center issued a tornado watch at 1:10 p.m. Central Daylight Time (CDT) early that afternoon for the eastern two-thirds of Oklahoma, northwestern Arkansas, and portions of north-central Texas. Radar images of the Moore tornado with a debris ball and signature hook echo. The thunderstorm that eventually produced the tornado developed less than one hour after the tornado watch was issued, around 2:00 p.m. CDT, across northern Grady County. Its rapid intensification resulted in the National Weather Service Weather Forecast Office in Norman issuing a severe thunderstorm warning for northern Grady, northwestern Cleveland, northern McClain, and southwestern Oklahoma Counties (including southwestern portions of the immediate Oklahoma City area) at 2:12 p.m. CDT. The thunderstorm quickly attained supercell characteristics, with rotation at the mid-levels of the storm's cloud structure becoming apparent even before it was officially classified as severe, due to the sufficient amounts of wind shear present over central Oklahoma. Due to the expected intensity of the storms, which were expected to be equal – if not, stronger – in severity to the supercells that produced the five tornadoes in the expected area of greatest tornadic threat the day prior, three of the Oklahoma City market's five television news outlets − NBC affiliate KFOR-TV (channel 4), ABC affiliate KOCO-TV (channel 5) and CBS affiliate KWTV (channel 9) − suspended normal programming and went into wall-to-wall weather coverage immediately after the tornado watch went into effect (Fox affiliate KOKH-TV (channel 25) and Telemundo affiliate KTUZ-TV (channel 30) began their coverage as the first severe thunderstorms erupted southwest of the state capital), and subsequently began relaying their audio feeds to radio stations throughout central Oklahoma. As the forecast suggested that the most significant severe weather would occur in the mid-afternoon, around the time classes concluded for the day, many worried parents began arriving at schools throughout Moore and south Oklahoma City to pick up their children in advance of the storm. At 2:40 p.m. CDT, as rotation in the supercell was increasing at the cloud base, a tornado warning was issued for far northeastern Grady, western Cleveland, northern McClain, and southern Oklahoma Counties, as the storm approached the Oklahoma City metropolitan area. The tornado touched down at 2:56 p.m. CDT in northeastern Grady County, near Long Drive and the southwest corner of the North Country Club Road and Northwest 32nd Street intersection, roughly 4.4 miles (7.1 km) northwest of downtown Newcastle. Initially a narrow cone-shaped tornado, it first caused EF1 damage to a home and some trees before rapidly intensifying and striking a semi-rural subdivision on the north side of Northwest 32nd, where several homes were destroyed, two of which were leveled at EF4 intensity. At this point, the tornado began to grow rapidly in size, evolving into a large, wedge-shaped structure; slight ground scouring began in this area. Several homes in a subdivision further to the northeast sustained EF3 damage. By 3:01 p.m. CDT, the National Weather Service issued a second, more strongly worded warning for the area: in a special weather statement that updated the existing tornado warning, the Norman forecast office declared a tornado emergency for southern Oklahoma City and Moore as various storm spotters confirmed that the large, violent tornado was approaching the area. The Twin Lakes dual-polarization NEXRAD radar (near Lake Stanley Draper) detected a tornado debris signature one mile in diameter within the accompanying hook echo, as the tornado crossed into portions of south Oklahoma City in northern Cleveland County. The supercell also produced straight-line winds of 80 miles per hour (130 km/h) for at least one mile surrounding the tornadic circulation. Extreme vehicle damage and ground scouring at the Celestial Acres horse training area. The tornado maintained EF3 intensity as it crossed the Canadian River into Cleveland County, and a decommissioned U.S. 62/U.S. 277 bridge was severely damaged; this bridge had to be demolished after the tornado ripped part of it from its mount and tossed it across Interstate 44. The tornado then continued directly toward south Oklahoma City and Moore, roughly following Southwest 149th Street. At that point, it began to grow rapidly in width, and a second brief area of EF4 damage was noted near South May Avenue, where several homes were leveled, and one was swept clean from its foundation (this home was determined to have been nailed, rather than bolted to its foundation). A vehicle frame, engine block, and various other vehicle parts were found tangled within a grove of completely debarked trees in this area. As the tornado began to cross into south Oklahoma City, a traffic jam had occurred for a stretch of several miles along Santa Fe Avenue, as residents attempted to either escape from or pick up their children at schools located near the tornado's path. As the station's news helicopter was capturing live video of the tornado, then-KWTV chief meteorologist Gary England − upon seeing footage of the backup that was being relayed by pilot Jim Gardner − urged drivers caught in the jam that may have been listening to the station's audio simulcast on area radio outlets to use nearby streets to detour out of the tornado's expected track. The tornado weakened briefly to an EF3 before re-intensifying to EF4 intensity near Forman Drive, flattening several homes as it moved through mostly rural areas south of Southwest 149th Street. As the tornado struck an oil production site, four oil tanks were blown away, one of which was never found. The others were thrown considerable distances, one of which was found a mile away. The tornado maintained its intensity as it struck the Orr Family Farm and the Celestial Acres horse training area, where up to 100 horses were reported killed, some being tossed into and tangled in downed power lines or thrown on top of nearby buildings; several horses that survived the tornado suffered severe injuries, with some being impaled by tree limbs or boards. Every building at Celestial Acres was either leveled or swept away at EF4 intensity, the ground on the property was scoured to bare soil, and vehicles were thrown and stripped down to their frames. A 10-ton propane tank on the Orr Farm property was picked up and thrown more than a half-mile through the air by the tornado, and a strip mall near the farm was completely leveled as well. The tornado continued east, heavily scouring an open grassy field before slamming into Briarwood Elementary School, which was completely destroyed at EF4 intensity (some sources say EF5, though a 2014 study published by the American Meteorological Society revealed evidence of poor construction at the school, and the official EF5 rating at that location was disputed and listed as EF4 in the study). Remarkably, no fatalities occurred at the school. Two 12,000-gallon water tanks that were also swept off of the Orr Family Farm grounds were thrown into this area; the roof of Briarwood Elementary was struck by one of them − potentially aiding in compromising the building's structural integrity as it bent the steel girders that held up the roof − shortly before the main vortex struck the building, while the other fell onto and destroyed a home a few blocks east of the school. Past Briarwood Elementary, the tornado intensified even further and entered densely populated areas of western Moore, including the Westmoor subdivision where many well-built, anchor-bolted brick homes were flattened at EF4 intensity, and two were swept clean from their foundations, with damage at those two homes rated EF5. Meteorologist Tim Marshall surveys a neighborhood that was devastated. The tornado continued generally northeast at EF4 strength, completely debarking trees and leveling entire neighborhoods. Many homes were flattened in neighborhoods to the east of South Santa Fe Avenue. One anchor-bolted home that was reduced to a bare slab in this area was initially rated EF5, but was later downgraded to EF4 as closer inspection of the foundation revealed that the anchor bolts were missing their nuts and washers. The tornado then destroyed Plaza Towers Elementary School at EF4 intensity, where seven children were killed as a result of a collapsed cinder block wall. More than a dozen homes in a subdivision just to the south of Plaza Towers Elementary were swept cleanly away, though they were revealed to have been nailed rather than bolted to their foundations, and damage to this subdivision was subsequently rated EF4. Entire blocks of homes were flattened, trees were completely debarked and denuded, vehicles were thrown and mangled, and the ground was severely scoured in other residential areas nearby, with the damage also rated EF4 in these areas. Most of the fatalities from the tornado occurred in the Plaza Towers neighborhood of Moore. In one of these houses (a block away from Plaza Towers Elementary), a woman was killed as she tried to seek shelter in a closet. The Moore Medical Center and many vehicles left in ruins after the tornado. Further to the northeast, at least a dozen cars were piled up against the front entrance of the Moore Medical Center, which sustained EF4 damage. One car was lofted and thrown onto the roof. Many homes in neighborhoods near the medical center were completely destroyed, including a row of four well-built brick homes with anchor bolts that were swept away, with damage to those four homes rated EF5. An open field directly behind this row of homes was deeply scoured, with only bare soil and clumps of dirt remaining. A nearby manhole cover was removed, and multiple vehicles were mangled beyond recognition and caked in mud in this area as well. The nearby Warren Theater was spared a direct hit, but still sustained considerable damage to its exterior. A bowling alley in the area was leveled, and a 7-Eleven was obliterated, with four people killed inside (including a three-month-old infant). The nearby Moore Cemetery was heavily damaged as well. The tornado briefly weakened and caused EF3 damage to some other businesses near Interstate 35, before crossing and mangling several vehicles in the process. The tornado regained EF4 intensity on the other side of the Interstate as it tore through several neighborhoods and destroyed numerous additional homes (though the EF4 damage swath was narrower at this point). A large grassy field between two subdivisions in this area was scoured to bare soil, with wind-rowed structural debris and several mangled vehicles strewn to the east. One brick home on Hunters Glen Court sustained EF5 damage, with only the slab foundation and anchor bolts remaining. Very little structural debris or house contents was recovered from that residence, and the small amount of debris that remained was wind-rowed well away from the site. Two vehicles were also lofted from the residence, one of which was thrown over 100 yards (91 m). A large, well-built home that sustained EF5 damage in eastern Moore. The tornado continued through Moore's eastern neighborhoods. Highland East Jr. High's main building was spared, but the separate gymnasium building was completely destroyed, and a set of lockers from the structure was lofted and thrown a considerable distance into a nearby neighborhood. The Moore Public Schools administration building, a converted former hospital located a few blocks to the east, was also struck and destroyed. The tornado was noticeably narrower at this point, but was still causing a continuous swath of EF4 damage to numerous homes as it moved through multiple subdivisions. A well-built, anchor-bolted home at the corner of Heatherwood Drive and Southeast 5th Street was reduced to a bare slab, sustaining EF5 damage. A large, well-bolted-down home at the end of a private drive near South Olde Bridge Road was also swept cleanly away at EF5 intensity. Debris was scattered well away from the site, a vehicle was thrown over 100 yards, and wind-rowing was again noted at that location. Further east, the tornado weakened to EF3 strength and exited the most populated parts of Moore, destroying six industrial buildings and damaging two others. A final small area of EF4 damage was noted nearby as two homes and a concrete building were leveled. The tornado then began to rapidly narrow and weaken, snapping and uprooting several trees and causing EF2 damage to a farm just east of Moore, where the house lost its roof and an outbuilding was destroyed. A pickup truck slid 200 feet (61 m) away from the farm into a field while remaining upright. The violent updrafts in the supercell that produced the tornado lofted debris from homes and other buildings in Moore at least 10 miles (16 km) outside of the tornado's outer circulation, with reports of various objects and personal possessions being found as far away as Midwest City. At 3:33 p.m. CDT, the tornado dissipated at a nearby treeline about one-third of a mile east of Air Depot Boulevard. Aerial view of a destroyed neighborhood to east of Interstate 35, taken by the Oklahoma National Guard. The Oklahoma Department of Emergency Management reported that 25 people were killed (with another death indirectly attributed to the tornado). An estimated 1,150 homes were destroyed, resulting in an estimated $2 billion in damages. The number of injured was 377. Entire subdivisions were obliterated, and houses were flattened in a large swath of the city. The majority of a neighborhood just west of the Moore Medical Center was destroyed. Witnesses said the tornado more closely resembled "a giant black wall of destruction" than a typical twister. Among the hardest hit areas were two public schools: Briarwood Elementary School and Plaza Towers Elementary School. A preliminary study of Briarwood Elementary School conducted in September 2013 by a group of structural engineers found some structural deficiencies that led to its collapse during the tornado. Chris Ramseyer, a structural engineer and an associate professor at the University of Oklahoma determined that the building's walls that were not reinforced with concrete, there had been a lack of connection between the masonry walls and support beams in several portions of the building, and anchor bolts were pulled from the ground by the tornado. Another engineer that was involved in the study stated that the deficiencies that Ramseyer pointed out were not uncommon building practices at the time, and that current building code standards would not ensure that Briarwood would have withstood winds in excess of 200 mph. At Plaza Towers, the second school to be hit, parents had been allowed to collect their children early in preparation for the oncoming storm, as by the time the tornado struck only about 75 students and teachers were in the building. Many students and teachers took shelter in bathrooms and closets, but in a newer addition to the building which housed the school's second and third grade classrooms, seven fatalities occurred. Third grade teacher Jennifer Doan was taking shelter with eleven of her students in a hallway when the tornado struck. Doan and her students were trapped when the walls of the corridor collapsed on top of them. Doan, who was two months pregnant with her third child at the time, suffered severe injuries to her back, but did not lose the baby. She and five of her students were pulled out, with the children suffering only minor to moderate injuries. Tragically, six of her students along with a student from another third grade class died. The Moore Medical Center was heavily damaged, but no one present in the building was injured by the tornado. The center's staff had to relocate 30 patients to a hospital in Norman and another hospital. Part of Interstate 35 was shut down due to debris that had been thrown onto the freeway. On May 21, Moore still did not have running water. There were more than 61,500 power outages related to the tornado. More than 100 people were rescued from areas that sustained significant damage from the tornado. Over a dozen emergency workers comb through the rubble of Plaza Towers Elementary School. The Oklahoma Department of Insurance estimated that insurance claims for damage would likely be more than $1 billion. Some meteorologists estimated that the energy released by the storm could have been eight to more than 600 times greater than the atomic bomb dropped on Hiroshima. Governor Mary Fallin stands with a family that survived the devastating Moore tornado. In addition to erroneous reports concerning the status of Briarwood and Plaza Towers students, various reports regarding fatality and injury counts as well as persons unaccounted for were circulated by traditional and social media outlets in the immediate hours after the tornado struck, which could not immediately be confirmed or refuted due to communications disruptions in the affected areas or were the result of incorrect counting due to miscommunication of estimates. Within the first two days, it was reported that between 237 and 240 people had been injured, with the tally later increasing to over 350. The final count of injuries was later adjusted downward to 212. On the morning of May 21, the medical examiner's office incorrectly stated that 91 bodies of tornado victims had been received. This number was up from the earlier report of 51 bodies that were incorrectly stated as having been received. 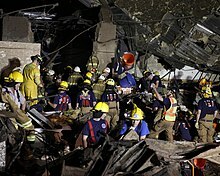 Upon the office's discovery that some victims were mistakenly counted twice due to communication errors made by Moore rescue response units that the bodies were admitted to area funeral homes (nearly all of the deceased were actually transported to the examiner's office in Oklahoma City), the actual number was revised downward and later confirmed at 24 tornado victims and two indirect victims. The first two deaths occurred in a house east of Briarwood Elementary School; one occurred near Santa Fe Avenue; seven occurred following a wall collapse at Plaza Towers Elementary; nine occurred within the neighborhoods mainly south of Plaza Towers Elementary; one occurred just east of Interstate 35; and one occurred in a home between Eastern Avenue and Bryant Avenue. A 90-year-old woman who suffered a fractured skull during the tornado later suffered a pair of strokes and died on August 5. On May 6, 2018, nearly five years after the tornado, a 14-year-old survivor who suffered posttraumatic stress disorder after losing seven of his friends at Plaza Towers Elementary School committed suicide. The 2013 Moore tornado was the deadliest tornado recorded in the U.S. since the Joplin, Missouri tornado that killed 158 people in May 2011. Patients were taken to Integris Southwest Medical Center and The Children's Hospital at OU Medical Center in Oklahoma City. Over 140 patients, including at least 70 children, were treated at hospitals. President Barack Obama talks on the phone to Oklahoma Governor Mary Fallin in the Oval Office. Oklahoma Governor Mary Fallin declared a state of emergency on May 20. She held her first post-tornado news conference at noon on May 21. The Federal Emergency Management Agency deployed urban search and rescue teams to the tornado-hit areas, and provided incident command personnel to organize and support rescue efforts. The Oklahoma National Guard was also deployed. Governor Mary Fallin requested assistance from President Barack Obama who declared a major disaster in the state and ordered federal aid to the affected areas. Governor Fallin quickly dismissed an idea to make a law that would require all schools in Oklahoma to have a shelter that would protect children during severe weather (prior to the tornado, only two of the twelve schools in the Moore Public Schools district had storm shelters, Kelley Elementary and Westmoore High School, which were rebuilt with concrete safe rooms after both were destroyed in the 1999 Bridge Creek–Moore tornado). Cleveland, Lincoln, McClain, Oklahoma, and Pottawatomie Counties received federal funding for hazard mitigation measure statewide. Obama visited the disaster-stricken areas on May 26. Major structural damage at Briarwood Elementary School. The third season finale of the sitcom Mike & Molly, titled "Windy City", was pulled by CBS from its original May 20 airdate within hours of the event due to the episode featuring a plotline involving a tornado descending on Chicago; the network later rescheduled the episode to air ten days later on May 30, 2013. At noon on May 21, the U.S. Senate held a moment of silence for the victims. Delegates from several countries and Pope Francis offered condolences, and the United Nations offered assistance in the recovery efforts. The Canadian Red Cross began accepting donations of money and supplies for their American counterparts, to assist with disaster relief and recovery. The damage from the tornado was still evident one month later. The United Methodist Committee on Relief, Direct Relief, Matt Kemp of the Los Angeles Dodgers, Kevin Durant of the Oklahoma City Thunder, Continental Resources, Devon Energy, ONEOK, Koch Industries, Hobby Lobby, and Carrie Underwood all pledged donations to the relief efforts. Moore Mayor Glenn Lewis stated that he would attempt to get an ordinance passed requiring storm shelters or safe rooms in new housing projects. On May 29, 2013, NBC aired Healing in the Heartland: Relief Benefit Concert, a fundraising concert that was held at Chesapeake Energy Arena in downtown Oklahoma City. The benefit was hosted by country singer and Oklahoma native Blake Shelton and featured performances from Miranda Lambert, Vince Gill, Reba McEntire, Rascal Flatts, Usher, Darius Rucker and Luke Bryan. The concert raised more than $6 million for the United Way of Central Oklahoma. On June 2, 2013, Discovery Channel aired an hour-long documentary about the storm titled Mile-Wide Tornado: Oklahoma Disaster. The documentary provides a comprehensive look at the tornado's impact and drew comparisons of the storm to the 1999 Bridge Creek-Moore tornado. The Moore City Council proposed a measure making twelve changes to its residential building codes, include requiring that new home construction in the city include hurricane clips or framing anchors, continuous plywood bracing and wind-resistant garage doors in order for homes to withstand winds up to 135 mph (equivalent to a high-end EF2 tornado). When the measure was passed in a unanimous vote held on March 17, 2014, Moore became the first city in the United States to adopt a building code addressing the effects of tornadoes on homes, which exceed the national standards set by the National Association of Home Builders. ^ a b Andrea Thompson (June 5, 2013). "Satellite picture reveals the scar left behind by Moore tornado". NBC News. Archived from the original on January 24, 2014. Retrieved January 24, 2014. ^ a b Diana Baldwin (August 2, 2013). "Victim dies 73 days after tornado". The Oklahoman. Retrieved May 11, 2018. ^ a b "2013 teen survivor of Moore school destroyed by tornado commits suicide". KFOR News. May 10, 2018. Retrieved May 11, 2018. ^ a b Oklahoma Event Report: EF5 Tornado (Report). National Centers for Environmental Information. National Weather Service Weather Forecast Office in Norman, Oklahoma. 2013. Retrieved May 11, 2018. ^ "Obama offers solace in tornado-ravaged Oklahoma". AFP. May 27, 2013. Archived from the original on June 30, 2013. Retrieved May 27, 2013 – via Yahoo! News. ^ a b c "May 20, 2013 0600 UTC Day 1 Convective Outlook". Storm Prediction Center. National Oceanic and Atmospheric Administration. May 20, 2013. Retrieved May 20, 2013. ^ "May 20, 2013 2000 UTC Day 1 Convective Outlook". Storm Prediction Center. National Oceanic and Atmospheric Administration. May 20, 2013. Retrieved May 23, 2013. ^ "May 20, 2013 Newcastle-Moore Tornado" (PDF). National Weather Service. National Oceanic and Atmospheric Administration. May 21, 2013. Archived from the original (PDF) on July 3, 2015. Retrieved June 1, 2013. ^ "2013 OUN Tornado Watch #191". National Weather Service Norman, Oklahoma. May 20, 2013. Retrieved May 28, 2013. ^ "2013 TSA Tornado Watch #191". National Weather Service Tulsa, Oklahoma. May 20, 2013. Retrieved May 28, 2013. ^ "2013 OUN Severe Thunderstorm Warning #316". National Weather Service Norman, Oklahoma. May 20, 2013. Retrieved May 25, 2013 – via Iowa Environmental Mesonet. ^ Holly Bailey (2015). "2:45 P.M., May 20". The Mercy of the Sky. Viking Books. pp. 124–127. ISBN 978-0-525-42749-0. ^ Holly Bailey (2015). "Plaza Towers Elementary, May 20". The Mercy of the Sky. Viking Books. p. 122. ISBN 978-0-525-42749-0. ^ a b Holly Bailey (2015). "3:05 P.M., May 20". The Mercy of the Sky. Viking Books. pp. 143–149. ISBN 978-0-525-42749-0. ^ "2013 OUN Tornado Warning #24". National Weather Service Norman, Oklahoma. May 20, 2013. Retrieved May 21, 2013 – via Iowa Environmental Mesonet. ^ a b c d "Damage Assessment Toolkit". apps.dat.noaa.gov. National Oceanic and Atmospheric Administration. May 20, 2013. Retrieved November 25, 2014. ^ a b c d e f g h i "NWS Damage Survey for 5/20/2013 Newcastle/Moore Tornado Event - Update 3". National Weather Service Norman, Oklahoma. National Oceanic and Atmospheric Administration. May 21, 2013. Retrieved May 23, 2013. ^ a b c d e f g h i j k l Tim Marshall; Kiel Ortega (February 5, 2014). "Damage Survey and Analysis of the 20 May 2013 Newcastle-Moore, OK, EF-5 Tornado". American Meteorological Society. Retrieved March 12, 2014. ^ "Special Weather Statement: Tornado Warning". National Weather Service Norman, Oklahoma. May 20, 2013. Retrieved May 21, 2013 – via Iowa Environmental Mesonet. ^ a b c Holly Bailey (2015). "3:00 P.M., May 20". The Mercy of the Sky. Viking Books. pp. 138–142. ISBN 978-0-525-42749-0. ^ Jane Glenn Cannon (May 23, 2013). "Oklahoma tornadoes: Historic bridge near Newcastle damaged beyond repair". The Oklahoman. The Anschutz Corporation. Retrieved May 25, 2013. ^ Scott Stump (May 21, 2013). "Farm battered by tornadoes: 'There is nothing there'". Today. NBC News. Archived from the original on January 24, 2014. Retrieved January 24, 2014. ^ Holly Bailey (2015). "3:23 P.M., May 20". The Mercy of the Sky. Viking Books. pp. 208–213. ISBN 978-0-525-42749-0. ^ "Moore Tornado | StateImpact Oklahoma". Stateimpact.npr.org. NPR. Retrieved November 19, 2013. ^ a b c d e Mike Bostock; Joe Burgess; Amanda Cox; Matthew Ericson; Hannah Fairfield; Ford Fessenden; Tom Giratikanon; Josh Keller; Haeyoun Park; Sergio Peçanha; Kevin Quealy; Graham Roberts; Archie Tse; Derek Watkins; Timothy Wallace (May 24, 2013). "Assessing the Damage Along the Tornado's Path in Oklahoma". The New York Times. The New York Times Company. Retrieved May 25, 2013. ^ Holly Bailey (2015). "3:15 P.M., May 20". The Mercy of the Sky. Viking Books. pp. 160–166. ISBN 978-0-525-42749-0. ^ "Tornado victims remembered: Shannon Quick". KFOR-TVpublisher=Local TV. May 24, 2013. Retrieved May 27, 2013. ^ a b c Tim Marshall; Kiel Ortega (February 5, 2014). "Damage Survey and Analysis of the 20 May 2013 Newcastle-Moore, OK, EF-5 Tornado (Presentation)" (PDF). American Meteorological Society. Retrieved March 12, 2014. ^ "Tornado victims remembered: Deanna Ward". KFOR-TV. Local TV. May 24, 2013. Retrieved May 27, 2013. ^ Trevor Welch (May 20, 2014). May 20th, 2013 Oklahoma tornado damage about 1 hour after (Motion picture). Moore, Oklahoma. Retrieved September 4, 2014 – via YouTube. ^ Elizabeth Chuck; Gabe Gutierrez (May 22, 2013). "Mother, infant who sought shelter in 7-Eleven among tornado victims identified". NBC News. Retrieved May 25, 2013. ^ Dale Denwalt (May 23, 2013). "Volunteers clean Moore Cemetery in advance of burials". The Moore American. Community Newspaper Holdings. Retrieved May 25, 2013. ^ Holly Bailey (2015). "3:27 P.M., May 20". The Mercy of the Sky. Viking Books. pp. 223–229. ISBN 978-0-525-42749-0. ^ Holly Bailey (2015). "3:35 P.M., May 20". The Mercy of the Sky. Viking Books. pp. 235–242. ISBN 978-0-525-42749-0. ^ "Moore, Okla. Tornado Death Toll Rises". The Weather Channel. The Weather Company. May 21, 2013. Retrieved November 19, 2013. ^ Josh Levs (May 24, 2013). "Students, teachers from tornado-leveled school say goodbye". CNN. Time Warner. Retrieved March 14, 2014. ^ a b c Trevor Hughes; Rick Jervis; Jonthan Shorman; William M. Welch (May 21, 2016). "Tornado had winds over 200 mph". USA Today. Gannett Company. Retrieved March 14, 2014. ^ Mike Bostock; Joe Burgess; Amanda Cox; Matthew Ericson; Hannah Fairfield; Ford Fessenden; Josh Keller; Tom Giratikanon; Haeyoun Park; Sergio Peçanha; Kevin Quealy; Graham Roberts; Archie Tse; Derek Watkins; Timothy Wallace (May 24, 2013). "Assessing the Damage Along the Tornado's Path in Oklahoma". The New York Times. The New York Times Company. Retrieved May 24, 2013. ^ "Massive Tornado Hits Moore, OK". The Daily Beast. IAC. May 20, 2013. Retrieved May 20, 2013. ^ "Structural faults found in destroyed Moore elementary school, engineer says". The Oklahoman. The Anschutz Corporation. February 21, 2014. ^ Carey Gillam; Ian Simpson (May 21, 2013). "Oklahoma lowers tornado death toll amid frantic search". Reuters. Retrieved May 21, 2013. ^ "Massive Tornado Kills At Least 24 In Moore, Hits Elementary Schools". KWTV-DT. Griffin Communications. May 21, 2013. Retrieved May 21, 2013. ^ Ashley Fantz; Ed Lavandera (May 22, 2013). "The day after, tornado survivors tell harrowing stories". CNN. Time Warner. Retrieved May 22, 2013. ^ Mark Schlachtenhaufen (May 21, 2013). "President pledges to aid Moore disaster recovery". Edmond Sun. Retrieved May 21, 2013. ^ "Oklahoma tornado spread destruction like a 'two-mile-wide lawnmower blade'". CNN. Time Warner. May 21, 2013. Retrieved May 22, 2013. ^ Jason Hanna; Rachel Clarke (May 21, 2013). "'We will come back strong,' governor vows". CNN. Time Warner. Retrieved May 22, 2013. ^ Seth Borenstein (May 21, 2013). "Power of Moore Tornado Dwarf Hiroshima Bomb". Associated Press. Archived from the original on January 27, 2014. Retrieved June 4, 2013. ^ Holly Bailey (2015). "3:45 to 6:00 P.M., May 20". The Mercy of the Sky. Viking Books. pp. 243–256. ISBN 978-0-525-42749-0. ^ Holly Bailey (2015). "May 21". The Mercy of the Sky. Viking Books. pp. 266–277. ISBN 978-0-525-42749-0. ^ a b Tom McCarthy; Haroon Siddique (May 21, 2013). "Oklahoma governor says 237 people injured in tornado – as it happened". The Guardian. Guardian Media Group. Archived from the original on January 24, 2014. Retrieved May 23, 2013. ^ Josh Levs (May 23, 2013). "Severe storms slam recovering Oklahoma City area". CNN. Time Warner. Retrieved May 23, 2013. ^ "Death Toll Revised Lower in Oklahoma Tornado". Voice of America. May 21, 2013. Retrieved May 21, 2013. ^ "F5/EF-5 Tornadoes in Oklahoma (1905-Present)". National Weather Service. National Oceanic and Atmospheric Administration. Retrieved May 21, 2016. ^ "91 casualties as mile-wide tornado flattens Oklahoma City suburbs". AntalyaCentral.com. Archived from the original on November 12, 2013. Retrieved November 19, 2013. ^ Chelsea J. Carter; Brian Todd; Michael Pearson (May 21, 2013). "Crews shift from rescue to recovery a day after Oklahoma tornado, official says". CNN. Time Warner. Retrieved May 21, 2013. ^ Carey Gillam; Ian Simpson (May 21, 2013). "Whole neighborhoods razed by Oklahoma tornado that killed 24". Reuters. Retrieved May 22, 2013. ^ "Hospitals treat more than 140 after Oklahoma tornado, including 70 children". New Haven Register. 21st Century Media. Associated Press. May 21, 2013. Retrieved May 21, 2013. ^ "FEMA, Federal Partners Support Response to Severe Storms in Oklahoma". Federal Emergency Management Agency. May 20, 2013. Retrieved May 21, 2013. ^ "Oklahoma governor calls out National Guard". KHOU. Belo. Associated Press. May 20, 2013. Archived from the original on June 20, 2013. Retrieved May 21, 2013. ^ "Gov. Fallin: Okla. will not have law requiring storm shelters in schools". KFOR-TV. Local TV. June 5, 2013. Retrieved November 19, 2013. ^ "Gov. Fallin Announces Federal Assistance Granted for Oklahomans Devastated by Tornadoes". The State of Oklahoma. May 21, 2013. Retrieved May 21, 2013. ^ Ezra Mechaber (May 26, 2013). "President Obama Tours Tornado Damage in Moore, Oklahoma: "We've Got Your Back"". WhiteHouse.gov. Retrieved May 28, 2013. ^ Chris Harnick (May 20, 2013). "'Mike And Molly' Finale: Tornado-Themed Episode Pulled In Wake Of Oklahoma Tragedy". The Huffington Post. AOL. Retrieved May 21, 2013. ^ "CBS' 'Mike & Molly' Tornado Finale Rescheduled for May 30". Screen Crush. May 28, 2013. Retrieved October 2, 2013. ^ "12:00 noon moment of silence-OK tornado victims". United States Senate. May 21, 2013. Archived from the original on January 18, 2014. Retrieved May 21, 2013. ^ "The Queen's message to President Obama". Monarchy of the United Kingdom. Retrieved May 22, 2013. ^ "Tornade aux Etats-Unis". Élysée Palace (in French). May 21, 2013. Archived from the original on June 5, 2013. Retrieved May 22, 2013. ^ "Kondolenztelegramm von Bundeskanzlerin Merkel an US-Präsident Obama". Federal Chancellor of the Federal Republic of Germany (in German). May 21, 2013. Archived from the original on November 9, 2013. Retrieved May 22, 2013. ^ Estefania Aguirre (May 21, 2013). "Pope praying for children, others struck by Oklahoma tornado". Catholic News Agency. Retrieved May 21, 2013. ^ "UN global disasters forum opens with condolences for Oklahoma City tornado victims". United Nations. May 21, 2013. Retrieved May 22, 2013. ^ "2013 Tornadoes and Severe Weather USA". Canadian Red Cross. Archived from the original on 2014-02-09. Retrieved May 21, 2013. ^ "UMCOR Assists Tornado Victims in Oklahoma" (Press release). PR Newswire. May 22, 2013. Retrieved May 22, 2013. ^ Rachael Cervenka (June 3, 2013). "Oklahoma tornades: California-based nonprofit donates medical supplies". The Oklahoman. The Anschutz Corporation. Retrieved June 3, 2013. ^ "Sports Xchange: Durant donates $1 million to tornado victims". Chicago Tribune. Tribune Publishing. May 21, 2013. Retrieved May 21, 2013. ^ "Continental Resources Supporting Oklahoma Tornado Relief With $2.5 Million Donation". WFSB. Meredith Corporation. May 21, 2013. Archived from the original on June 23, 2013. Retrieved May 21, 2013. ^ "Devon Energy Pledges Millions To Tornado Disaster Relief". KWTV-DT. Griffin Communications. May 21, 2013. Retrieved May 21, 2013. ^ "ONEOK to Donate $1 Million to Tornado Disaster-Relief Efforts in Oklahoma". ONEOK (Press release). Tulsa, Oklahoma. May 21, 2013. Retrieved May 23, 2013. ONEOK, Inc. (NYSE: OKE) today announced that the ONEOK Foundation will donate up to $1 million to support disaster-relief efforts in Oklahoma following this week's devastating tornado outbreak. ^ "Koch Industries, Inc. Donates to Oklahoma Tornado Relief". Fort Mill Times. The McClatchy Company. May 21, 2013. Archived from the original on June 19, 2013. Retrieved May 21, 2013 – via The Herald. ^ "Oklahoma tornadoes: Hobby Lobby pledges $2 million to tornado relief". The Oklahoman. The Anschutz Corporation. May 25, 2013. Retrieved May 25, 2013. ^ "Carrie Underwood's Incredibly Generous Donation to Oklahoma". Yahoo! News. May 24, 2013. ^ "Oklahoma-Moore-Ordinance". WYFF. Hearst Television. Archived from the original on December 26, 2013. Retrieved May 22, 2013 – via CNN. ^ Erin Coulehan (May 31, 2013). "Blake Shelton Tornado Relief Concert Raises $6 Million". Rolling Stone. Wenner Media LLC. Retrieved June 3, 2013. ^ "About Mile Wide Tornado: Oklahoma Disaster". Discovery Channel. Discovery Communications. Retrieved June 11, 2013. ^ "Moore considers enacting a stronger building code". The Oklahoman. The Anschutz Corporation. March 10, 2014. ^ "Moore City Council takes historic step in bolstering homes". The Oklahoman. The Anschutz Corporation. March 17, 2014. Wikimedia Commons has media related to 2013 Moore tornado.